A virtual phone number from United World Telecom is a telephone number that routes calls via the internet instead of over traditional telephone lines. This service reduces the costs for local and international calls and enables the owner of the number to control how it works using a simple interface. 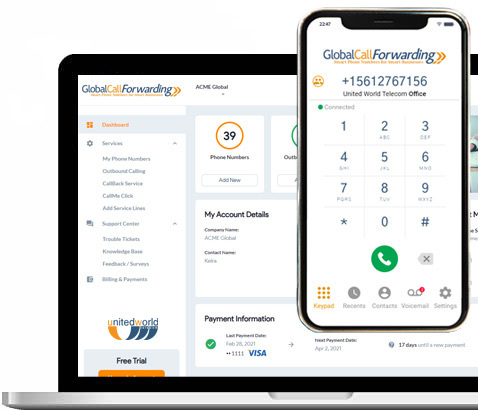 United World Telecom provides virtual phone numbers in over 140 countries across the globe with advanced features and international call forwarding capabilities with attractive rates and the ability to try the service for free, before you make a purchase. If you intend on expanding your business internationally, it is likely you’ll need an efficient, respectable virtual phone system to test out new markets without the overhead, which is exactly why virtual phone numbers can be essential. They give you the ability to instantly establish a presence internationally without having to open a new office in a foreign country. How much do virtual phone numbers cost? The cost of virtual phone numbers can vary depending on the country the number is based out of, as well as where the call is being routed. For specific pricing you can simply fill out the first step of the form on this page, and you will be presented with exact pricing on the second step (no personal information required!). What premium features available for virtual phone numbers? United World Telecom offers premium features at an additional rate which can be added on easily to your virtual phone number order. These features include rollover, call recording, and outbound calling. What free features are included with virtual phone numbers?